First up – how lovely is this card from my friend Caroline? 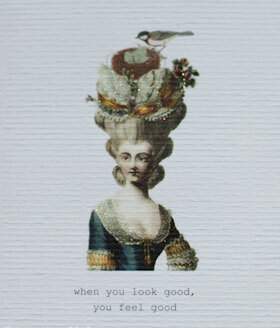 The message made me smile – ‘When you look good, you feel good.’ Plus I love that it’s Marie Antoinette who is supposed to have said those delicious words – seems more plausible than her more famous line – let them eat cake! Sending someone a well thought out birthday card taps into a time long before a quick email or Happy Birthday message on Facebook. I resolve to be a better birthday card sender going forth – with or without cake, but preferably with. Last night I continued my birthday celebrations with a few of my girlfriends at Hatfields. It was their first annual Pink Apron Dinner for Breast Cancer Awareness Month (October) – in conjunction with the debut of writer Charlotte Druckman’s forthcoming book, Skirt Steak (Chronicle Books, 2012), the dinner was prepared by chefs (in pink aprons) Mary Sue Milliken (Border Grill), Sherry Yard (Spago Beverly Hills), Suzanne Tracht (Jar), Dakota Weiss (NINETHIRTY at W Los Angeles), Nyesha Arrington (Wilshire Restaurant), and Karen Hatfield (Hatfields and The Sycamore Kitchen). This was a great event and the perfect party with laughter, conversation, catching up, new friends and old and some really great presents – including a special cake, just for me!!! Ever struggled with what to give someone for a birthday present? Well struggle no more. Having just received some of the best and most inspired birthday presents ever I thought I’d share a few ideas. I was surprised to learn that most cookbooks given are never cooked from – they are looked at, the pictures drooled over and sometimes, maybe, read from cover to cover. When I give someone a cookbook I really hope they throw themselves into it and find a couple of new exciting recipes to add to their repertoire. 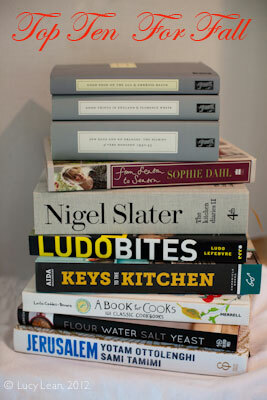 I love new cookbooks – my lack of shelf space is testament to that! This fall there are so many great new cookbooks to choose from it’s hard to make a top ten but here goes, in no particular order: Ottolenghi’s Jerusalem (get the UK version at Amazon.co.uk – mine even came signed! ), Flour Water Salt Yeast by Ken Forkish (more about this wonderful book later in this post), A Book for Cooks; 101 Classic Cookbooks, Keys to the Kitchen by Aida Mollenkamp – more about this book later this week, LudoBites – released today and I’m already marking off must cook recipes to challenge me in the kitchen, Nigel Slater’s The Kitchen Diaries 2, Sophie Dahl’s From Season to Season and these three Persephone cookbooks Good Food on the Aga, Good Things in England, A Few Eggs and No Oranges – that aren’t exactly new but are probably the ultimate in gift giving. In fact any Persephone book will make a great gift – the simplicity of the dove grey covers make them fabulous additions to any bookshelf and you can order directly from Persephone and skip Amazon. I am working up to 50 shades of Persephone grey on my shelf – which is only half of their entire collection. They even offer the Perfect Present – book recommendations for any occasion and for any reader. However, I think the ultimate present would be to sign someone up for the book a month subscription. A couple of weeks ago I was continuing my usual post-Paris-moan about not being able to find great bread in LA when Ludo handed me a book about bread baking – Flour Water Salt Yeast by Ken Forkish. 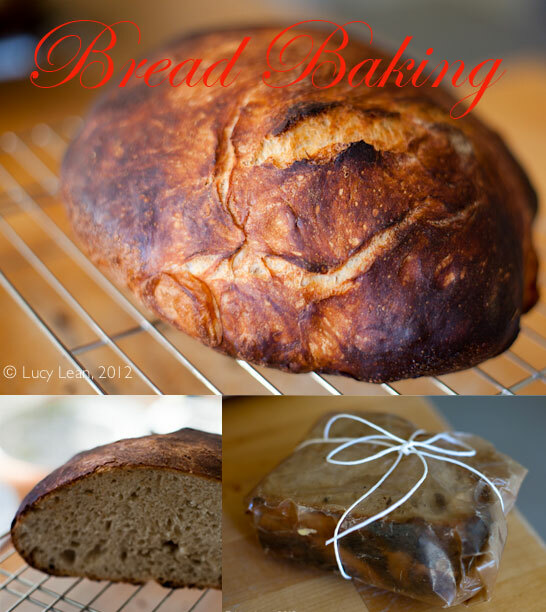 I love a challenge and so jumped straight in, carefully following the recipes and making batch after batch of delicious crunchy fresh bread. I have unleashed a new passion/obsession/fetish – for the perfect crust and crumb. Well, as every chef knows – your bread is only as good as the bread knife you use to cut it – or something like that! To round out the gift I was given a beautiful Global bread knife – and most important to remember – I gave Krissy and Ludo a penny – don’t want to cut the relationship and superstitious as I am I’ll not risk this one! So if you give a knife, have them give you a penny! Another pressie that came out of the bread making craze – a metal knob for my oven. 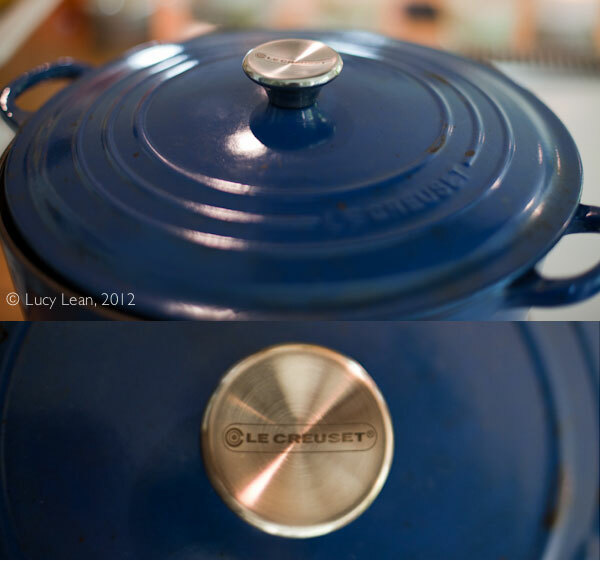 I love my Le Creuset Dutch Oven (it was a wedding present from my friend Mike in NYC) but there’s one small problem – at the high temperatures needed to get that crust the plastic handle can melt! I know, a serious design flaw! I removed the plastic handle and precariously set the screw in the hole, so as not to lose any steam. And then along came my housekeeper, tipped the lid over to wash it and bye bye screw down the drain… Luckily, my friend Charlotte, who has subsequently joined the bread making band wagon after I gave her some of my bread, ordered me a special metal handle as she placed an order for every single gadget and bucket and thermometer and proofing bowl out there. Let me just say that I dove straight in and used the digital thermometer from the medicine cabinet for the temperature of the water, plastic mixing bowls for proofing and my old Le Creuset (sans plastic) for the baking. Who doesn’t love flowers? 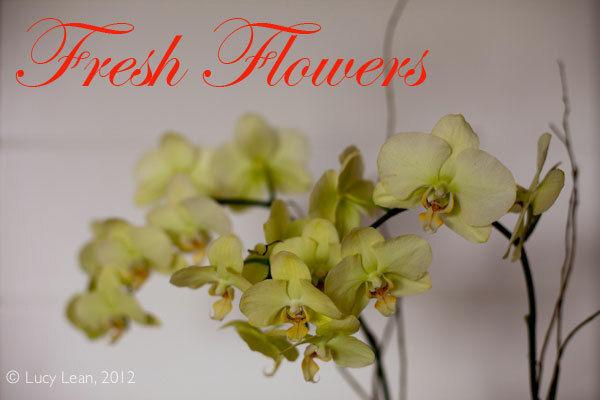 But rather than send someone cut flowers it’s so much better and no more expensive to send or give an orchid or two. Not only are these flowers classic, stylish and oh so chic, but they don’t go bad, as in they don’t die days after the celebration is over. Weeks and even months or years later these plants keep on going. I have taken to putting the old orchids outside and waiting for a couple of months for them to re-flower. Thank you to the lovely ladies who drove over from the West side to celebrate with me last night and brought with them these beauties. You all know how much this girl loves her bubbles – so unless you know your recipient is a signed up member of AA or like my friend Lisa doesn’t like Champagne (she does like rosé though) – a bottle of the good stuff is always an excellent present. Thank you Anneli for this golden box of bubbles – this is what Olivia de Havilland drinks every night at 6pm – so I’m following suit – perhaps the secret to her 96+ years and still going strong? A little soft candle light – for that post dinner romantic glow? A heavenly scent to fill the room. I love to light a candle and snuggle up with a great book so a great gift would be to pair a Persephone book with a scented candle – you could even get crazy and try to match the title with the scent. 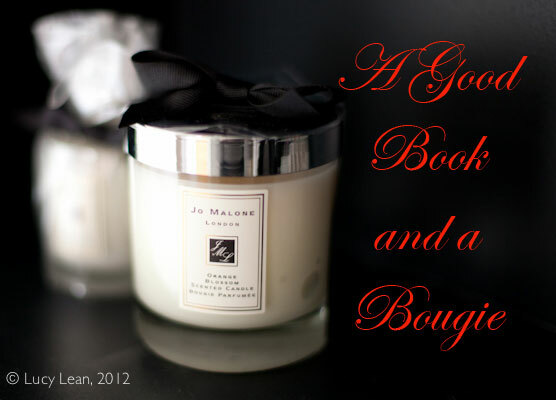 A scented candle is a small luxury that you probably wouldn’t buy yourself but would love to get. My current favorite scent is Jo Malone’s English Pear and Fresia or that tried and tested old classic Orange Blossom (matches my cologne). To take the time to bake someone a cake is perhaps the ultimate birthday gift – Nigel Slater chose this as his number 1 comfort food when I asked him – it takes time and effort and thought to mix up ingredients, bake and then decorate. 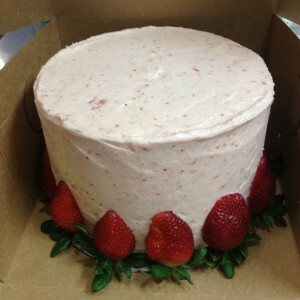 I was totally surprised and touched last night at my birthday dinner with my girlfriends when Waylynn Lucas gave me a beautiful 3 tiered strawberry cake she had made. Waylynn has started making birthday cakes at her shop fonuts as well as ice cream and her classic fonuts. Waylynn says “I have this weird need to always make sure anybody in my life has a b-day cake!” It was delicious, thoughtful and so unexpected – perhaps that old cliché is really true – it’s the thought that counts – especially when it comes in the form of a pink cake with candles. Thank you Waylynn! « Scones Recipe – Downton Abbey returns! Happy Birthday! It looks like you had a wonderful celebration with dear friends. There’s nothing better than that! Thank you for the list of cookbooks. I’ve been looking for some new ones to add to my collection. happy birthday, Lucy! Cheers to another year of good food, friendship, love, and family!